All alternative decking materials are not created equal. Azek Decking Systems feature solid-core, cellular PVC construction, containing no wood fillers that can compromise performance. Azek's advanced formulation produces one of the strongest and lightest materials for decks available. Azek's technology takes on the elements. A solid, impeccable finish is what you get with decks by Azek. Even better, there's no need to pre-drill for screws. The versatile rim joist cover adds flexibility to your deck design. Also, screws are self-countersinking with no surface distortion. And just for a finishing touch, Azek even offers color matched screws. Thanks to Azek's grain embossing system, you'll see tremendous scratch resistance and grain retention over time, even in high traffic areas. 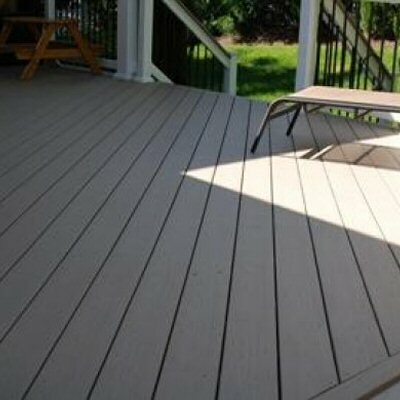 Also, Azek's resilient decking material composition means that even stubborn stains and mold don't stand a chance. Azek's proprietary embossing system creates one of the most aesthetically pleasing wood grain finishes in the industry. You'll enjoy the classic beauty of stained wood decks without the ongoing hassle of upkeep. The natural wood grain finish also provides slip resistance.